INTERNATIONAL ORGANIZATIONS AS “STATES PARTIES"
First: The member states of an intergovernmental organization must have transferred partially or wholly their competence over matters governed by the Convention, including the competence to enter into treaties in respect to matters governed by the Convention. A state party may - in theory - transfer all of its rights of voting, decision-making, and presentation and nomination to an organization. Although the provisions allow for the transfer of "obligations," it is not clear to what extent a state can transfer obligations laid upon it by the Convention. To what extent does the term "transfer of competence" include obligations? The Annex mentions that the organization is to comply with obligations, but this might be easier said than done. In any case, state parties to an organization carrying out activities in the Area are to ensure that appropriate legislation for indemnity is implemented in respect to such organizations. 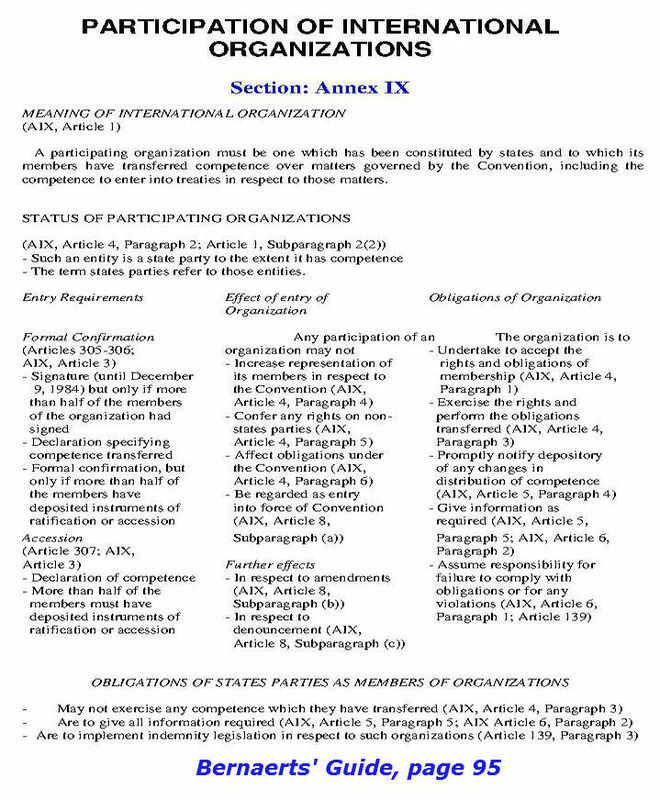 Second: An organization may deposit an instrument of formal confirmation or accession only if (a) a majority of its members have deposited their instruments of ratification or accession, (b) a declaration is deposited specifying the competence which has been transferred, and (c) the instrument of the organization contains an undertaking accepting the rights and obligations of states in respect of matters relating to which competence has been transferred. Under no circumstances may the participation of an organization create more or new rights. 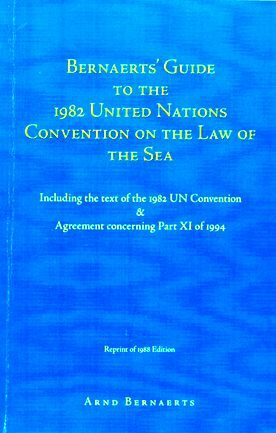 For this reason, there may be no increase in representation, rights under the Convention may not be transferred to member states which are not states parties to the Convention, nor may the obligations arising from the agreement establishing the organization prevail over the obligations under the Convention; finally, the instrument of formal confirmation or accession of an international organization is not taken into account in determining when the Convention enters into force. With respect to responsibility, liability, and settlement of disputes, regulatory provisions are provided to place membership of organizations on equal footing with membership of states. The participation of organizations appears to be a simple matter, but if a larger number of organizations take advantage of the opportunity, it might prove very problematic if, for example, not all member states of an organization are states parties to the Convention, or with respect to "obligations" of the Convention for states parties. The European Economic Community is so far the only international intergovernmental organization to have even signed the Convention, but it or other organizations might yet confirm or accede to the Convention.